If there is one make up product that I am always trying out new versions of, it is concealers. I feel like I am forever on the hunt for the best of the best when it comes to concealers and when I saw Barry M had released the Flawless Light Reflecting Concealer I knew I had to give it a try! Having tried a couple of their foundations in the past and not being a huge fan of them, I was still excited to try this out, having heard great things. This concealer is available in three different shades, I have the lightest shade in Ivory and it is the perfect colour for my pale skin, if anything it is slightly too light which is great for us polar bears. The applicator is a brush which is different than any concealer I have tried recently, most of the concealers in my collection have a doe foot applicator. I didn't think I was going to like the applicator as much as I do but it makes applying the product to my under eye so easy. This concealer claims to cover imperfections without making it look cakey and is infused with cucumber and aloe extracts to sooth and revitalise the skin. Its also perfect for tried eyes. I only really use this concealer under my eyes because of the light reflecting properties. I have really become obsessed with using this concealer under my eyes, it brightens the area up massively while covering my dark circles. While still using amazing results it doesn't leave my under eye area looking cakey or heavy, the concealer is so light weight yet it is pretty creamy at the same time. The coverage is buildable if you do want a higher coverage. It lasts amazingly well throughout the day and doesn't crease or settle into the little lines under my eyes. Even though I mainly use it under my eyes, I have used it on blemishes a few times and I don't hate it but I do prefer to use a different concealer on my blemishes and redness for a high coverage. 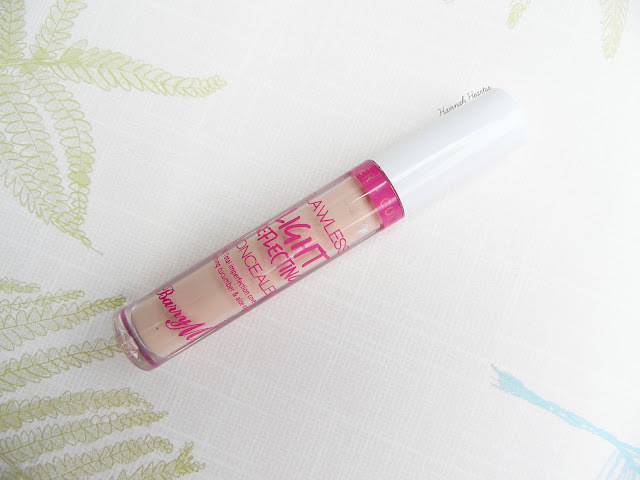 I have had this concealer in my handbag most days and it is perfect for touch ups on the go. The Barry M Flawless Light Reflecting Concealer retails for £4.49.